Observation - DAY FLYING MOTH ? - UK and Ireland. Description: While trying to photograph a marsh fritillary butterfly this moth distracted me by landing beside it,I didnt get the fritillary and would like to know what this is if possible, no other photo available.It was nectaring on brambles. 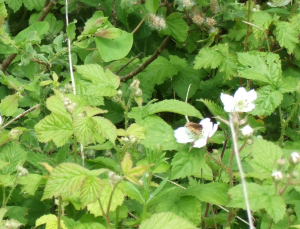 While trying to photograph a marsh fritillary butterfly this moth distracted me by landing beside it,I didnt get the fritillary and would like to know what this is if possible, no other photo available.It was nectaring on brambles.